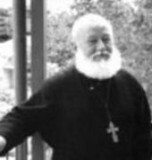 The Diocesan Administration wishes to inform all clergy and parishioners that Priest Ioann (Ian) Bojko, the last priest of the Orthodox Church in America still residing in Australia, passed away after a long illness on 25th January 2013. Fr John was rector of the Holy Annunciation Church in Brisbane and it was in his term of office that the parish joined ROCOR and became a parish of the ANZ Diocese. Fr Ioann was a gentle soul and his passing will be greatly felt by all. Fr Ioann’s funeral will take place on Wednesday, 30th January 2013 at Holy Annunciation Church, 163 Park Road, Woollongabba. Ioann (in English, Ian) was born in August 1934 on the Dnieper River, Ukraine. During the German Occupation, he lived with his father’s family in Kiev, where he had just commenced schooling. In Spring 1943, his family was transported to Slovenia; with the advance of the Soviet Army, the family moved to Lindau, Germany. After the war, he attended the Russian Gymnasium (School) for ‘Stateless’ persons, Munich, and attended the Synodal church where Metr. Anastasy Gribanovsky served. The Bojko’s arrived in Australia as Displaced Persons in December 1950. Ian arrived in Adelaide the next month, finding work at an electricity station, and then at the Customs Service in a wool store bonded warehouse. Archbishop Theodore (Rafalsky) tonsured Ivan a reader at St Nicholas parish, Adelaide, in 1953. Three years later, when Hieromonk Dimitry Obuhoff was seeking candidates for the monastic life, Reader Ian joined him. However, establishing the monastery was so physically difficult that the project could not go ahead. Fr Dimitry was transferred to be parish priest in Geelong, and Reader Ian accompanied him to look after him. While in Geelong, Ian was ordained a subdeacon, and assisted greatly in the construction and beautification of that parish. In November 1963, when Fr Dimitry was transferred to the Vladimir Icon parish, Rocklea, Subdeacon Ian again went with him. Soon after, in January 1964, Bishop Philaret (Vosnesensky) of Brisbane ordained him a deacon to serve at the Vladimir Icon parish, which he did until August 1988 when he transferred to the OCA and began attending Holy Annunciation Orthodox Church. 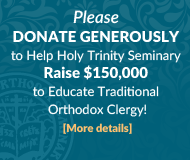 He was ordained to the priesthood by Bishop Gibran (Ramlawey) (Primate of the Antiochian Orthodox Diocese of Australasia) in 1989, at the request of Metropolitan Theodosius, and was appointed rector of Holy Annunciation Orthodox Church. His rectorship will be remembered for the quiet, faithful service that Fr Ian sacrificially rendered the parish, keeping an outpost of Orthodoxy alive for sixteen years (between 1989 and 2005), both while he worked at the railways and in his secular retirement. Ill health forced the retirement of Fr Ian from pastoral duties, with his final Liturgy at Holy Annunciation Orthodox Church being served in 2005. He resided in Brisbane until his repose in January 2013. The First Panikhida (Memorial Service) was held at 4.00pm on 26 January 2013, at Holy Annunciation Orthodox Church.